21 Savage did not disclose why he was being bandaged up. This has been a quiet year for 21 Savage this year. When he decides to drop a new project, there's no doubt that the people will take notice but for now, 21 seems to be enjoying his time listening to old R&B records and chilling with his friends. Appearing on a few tracks on the Superfly tracklist and jumping on songs with Ty Dolla $ign, FBG Duck and SahBabii, 21 has not released much of his own music in the last few months. Perhaps he's keeping quiet to build speculation about his upcoming work? 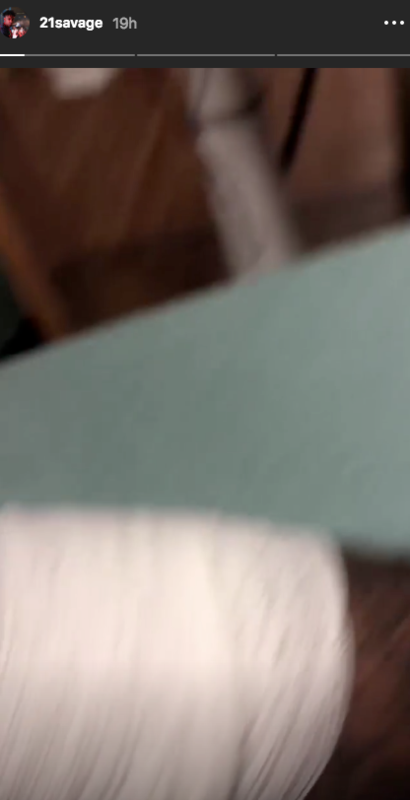 Regardless, it appears as though Savage got himself into a bit of an uncomfortable situation as he shared some footage of himself from the doctor's office. He's not entirely clear about why he ended up at the health center but he showed off the fresh bandages on his arm on IG. Whether he has a cut, a burn or something else is unclear at this point but he's been updating his Instagram story since posting. It's likely to be something minor since he's not really focusing on it. Hopefully, whatever led 21 to the doctor's isn't serious. His ex-girlfriend Amber Rose has recently moved on with Denver Nuggets baller Monte Morris and he seems unbothered, crooning his favorite R. Kelly and SZA tracks for the world to join in on. Check out the cryptic post below.